MIAMI (AP) Kelly Olynyk had game-highs in points and rebounds, which was easy to see in the box score. The play of the night wasn’t so obvious. Olynyk scored 25 points and grabbed 13 rebounds, Goran Dragic added 24 points and 13 assists and the Miami Heat held off the Detroit Pistons 111-104 on Wednesday – moving three games over .500 for the first time since April 2016. That grind was evident in the final minute. Dragic missed a shot with the Heat up three, and Olynyk knew he couldn’t grab the rebound. So he tapped it to Josh Richardson to extend the possession, and Dragic wound up setting Olynyk up for a layup 14 seconds later to give Miami a five-point lead and put the game away. ”Kelly’s a smart player,” Dragic said. Richardson scored 22 for Miami, which shot 51 percent and outscored the Pistons 51-27 from 3-point range. James Johnson scored 16, Wayne Ellington had 12 and Hassan Whiteside added 10 for the Heat. Tobias Harris led Detroit with 19 points. Reggie Bullock scored 17, Avery Bradley and Boban Marjanovic had 15 apiece, Dwight Buycks scored 14 and Luke Kennard added 13 for the Pistons. The Pistons were without center Andre Drummond, sidelined by bruised ribs. That meant Marjanovic made his first start since the end of the 2015-16 season, when he was with San Antonio. Olynyk and Whiteside are both 7-footers. Marjanovic is listed at 7-foot-3, and he seemed to tower even over the tallest Miami defenders. Marjanovic was 5 for 8 from the field, 5 for 5 from the line, and led Detroit with nine rebounds. It’s unclear when Drummond will be back, though soon seems likely. Pistons: Detroit is 20-16, after being 16-20 at this point a year ago. … Bullock was 4 for 4 in the third quarter, all from 3-point range. … This game started a stretch where Detroit plays six of eight on the road. After that, they’ve got 14 out of 18 at home. Heat: Miami was 17 for 34 from 3-point range. Olynyk and Richardson, Miami’s starting forwards, opened a combined 6 of 6 from beyond the arc. … Miami has now played on 11 Wednesdays (in 12 weeks) this season, but no Thursdays. 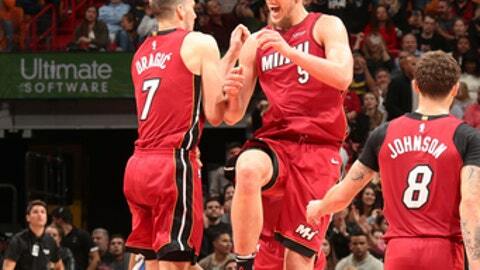 … Ellington’s 3-pointer with 6:39 left put Miami up for good in a game that had 14 lead changes and 11 ties. Bradley returned for Detroit after missing seven games with a hip-groin injury. The Heat got James Johnson back after he sat six of Miami’s last seven with bursitis in his right ankle. Miami is still without Justise Winslow (knee) and Dion Waiters (ankle). Detroit will be without Reggie Jackson (ankle) until at least the All-Star break. Spoelstra was hit with his sixth technical this season, and he cringed when told no coach has more. Van Gundy got one for arguing, insisting he only said ”come on” to referee James Williams. Van Gundy thinks it was his first technical not accompanied by profanity. ”Definitely the first time I’ve gotten one for saying `come on,”’ he said. Pistons: Visit Philadelphia on Friday. Heat: Host New York on Friday.